As someone who used to work in online LGBT news media, and who now works in theatrical media, Pink Paper’s “Top 5 gay West End musicals” article piqued my interest for multiple reasons when it turned up on Twitter. Unfortunately, it’s so riddled with errors that it’s almost laughable. The West End has never had so much competition attracting tourists as the capital has become the place to be this summer. Rather than give up, the industry has pulled out all the stops to entice eager theatre fans, and it seems they have followed the advice of theatre producer Max Bialystock, following the manta: “whatever you do on the stage, keep it snappy, keep it happy, keep it gay!”. Unfortunately, while that quote does indeed come from The Producers, where Max Bialystock and business Leo Bloom attempt to create an über-camp pro-Nazi musical with the hope of fleecing their investors, the line quoted comes from the director they hire, Roger De Bris, and not Bialystock. And if West End producers really were following the “manta” [sic], surely all five musicals would be gay, or gay-themed? Instead, only one of the five could be said to be gay-themed – and it’s neither a musical nor in the West End. 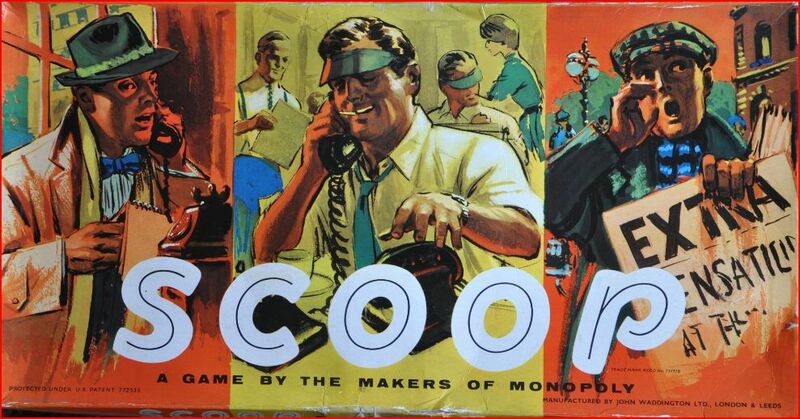 I’m indebted to Jon Slattery for inducing a bout of nostalgia in his mention of the 1950s board game, Scoop, which he found in a Camden charity shop. My grandmother had the same game, and seeing Jon’s photos of the box and the “editor’s phone” – a quasi-random device that determined the outcome of your attempts to fill your front page. Pulling a handle back and forth would move a circular dial with a number of options, one of which would be the editor’s decision regarding your story. It had the sort of tactile, role-playing greatness that merely rolling a die could never achieve. The whole post brings back happy memories of playing the game, kneeled around the coffee table in the front room on many a wet and dreary Doncaster day. It [the Guardian] is rushing out high volumes of coverage and repeating allegations by such sources as unnamed Met officers implying that ‘thousands’ of individuals were the object of illegal phone hacking, an assertion that is roundly contradicted by the Met assistant commissioner’s [John Yates’s] statement yesterday. The Guardian coverage, we believe, has substantially and likely deliberately misled the British public. Two years later, we found out that the Guardian’s coverage was spot on. The ebook splits the developing story into a number of chronological chapters, each starting with a brief timeline before reprinting the news articles covering the unfolding story. It’s a good reminder of how the evidence against NI started piling up, until the possibility that murdered teenager Milly Dowler’s voicemail had been hacked up caused the story to blow up so spectacularly and the media who had previously ignored the issue. The book is the first in a planned series of Guardian Shorts, topical ebooks which provide background for current news stories. By sidestepping the traditional print route, existing content can be repurposed – and charged for – cheaply (the phone hacking book costs just £2.29 for the Kindle, and will presumably be a similar price when it makes its way to Apple’s iBooks store). There’s also a speed issue: the paper can publish a book electronically months before a bound paperback can hit the shelves. In comparison, Guardian journalist Nick Davies’ own book on the saga won’t be published until autumn 2012. The most annoying thing about the book is that it shows up just how awful the typographical defaults of Amazon’s Kindle iOS app are. I don’t know how much freedom Amazon’s implementation of the ePub format allows designers, but both this Kindle book and others I’ve purchased make me yearn for a well-designed page. Apple’s defaults within its iBooks reader do look nicer. Still, I’ve yet to find any ebook which is as well-designed, or comfortable to read, as a paperback that’s been typeset by someone who knows what they’re doing. Author Scott MatthewmanPosted on August 10, 2011 August 10, 2011 Categories Books, MediaTags board games, Media, newspaper, phone hacking, The Guardian1 Comment on Scoop! Twitter never lets accuracy and truth get in the way of passing on a line that is guaranteed a few retweets, followed by an irrelevant post on Mashable. — Dave Lee rants (in a good way) about people taking Twitter as a serious source of news. It’s not – it’s more akin to pub conversation, the sort that allows old wive’s tales and silly lies to propagate. > The temptation if you’ve got to cut costs by 5 per cent is just to salami slice and everyone works a bit harder and quality just deteriorates a little bit more. What you end up with when you finally decide to put it behind a paywall is something that’s not good enough to persuade people to pay for. > Media groups have got to focus much more clearly on what is their unique selling point – keep the investment there, possibly increase the investment there, and everything else, which may be necessary as part of a package, because a newspaper is a package, they don’t have to produce themselves, they can buy that in. I’m not convinced by anybody’s arguments that paywalls are a viable way to make internet services pay, particularly if current qualities are anything to go by. Once you lock away your newspaper content from a public gaze, you then have to devote much more energy and resources into marketing that content in order to gain conversions to digital subscribers — and that will likely eat up most, if not all, of any revenues which a paywall may generate. Concentrating on a USP is far more likely to generate increased returns. > West Bromwich East MP [Tom Watson] spoke out after a Whitehall official wrote a 20-page strategy paper for government departments on how to use the medium, which has a limit of 140 characters per message. > Even its author, Neil Williams, the head of corporate digital channels at Lord Mandelson’s Department for Business, Innovation and Skills, admits the 5,382-word official “template” might be regarded as “a bit of over the top”. > Boasting 36,215 characters and spaces, it would need roughly 259 separate “tweets” to be sent via Twitter. How dreadful that a style and usage guide is long. Who could possibly conceive of such a thing? , the newspaper’s stylebook, is 362 pages in length. > Last week, the Times went up from 65p to 70p. So that, you might say, is the end of the price war that Rupert Murdoch… launched 14 years ago in the “quality” sector when he cut the price of the paper by a third. > All the upmarket dailies (except the FT) now sell, Monday to Friday, at the same price. Or do they? As with most journalism, when a question mark appears it can be followed straight away by a “no”. In Wilby’s case, he argues that papers offering subscription sales for lower than the cover price are offering a “price cut by another name”. > The price of the weekday Guardian raises by 10p to 80p today.